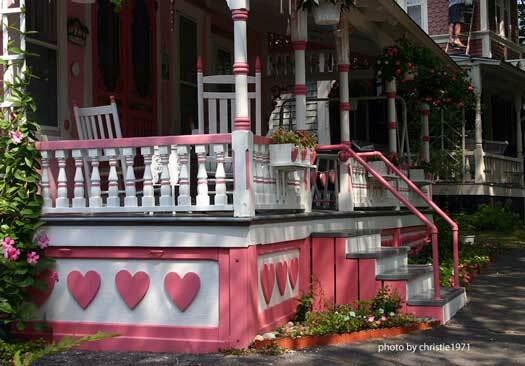 Valentine decorations are perfect for your porch. 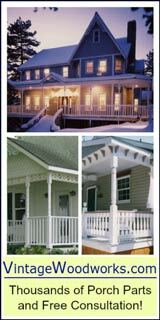 Even if you live in snow country, adding some outdoor valentines decorations to your porch will make it festive for this love-filled holiday. 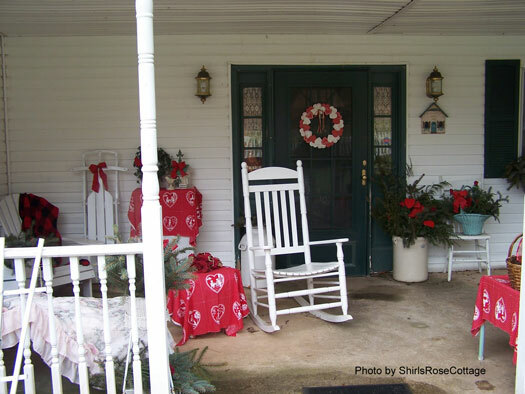 Sometimes just a touch of red - a pretty wreath, a small red pillow, a banner or wall art - is all that you need to say "Happy Valentine's Day" on your porch. Shared by Garden Artist with us. 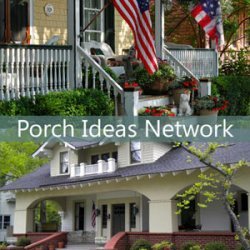 This is her parent's porch. 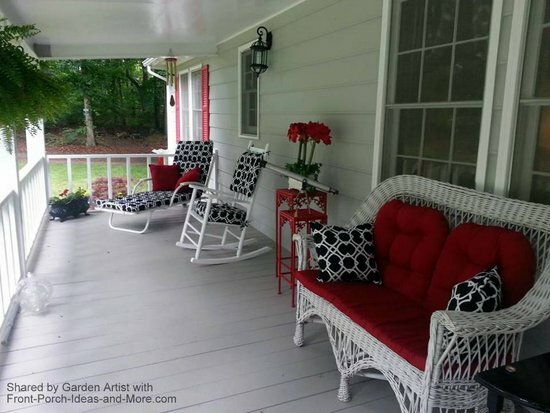 While this porch is perfect for year round, the bright reds are lovely for Valentine's Day. 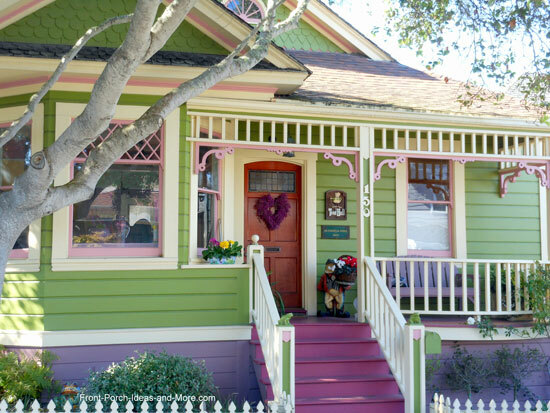 We saw this adorable porch while on a trip to California at Valentine's Day time. The colors and details are truly gorgeous. 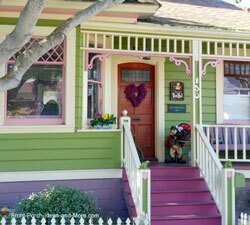 See the purple heart-shaped wreath at the front door? 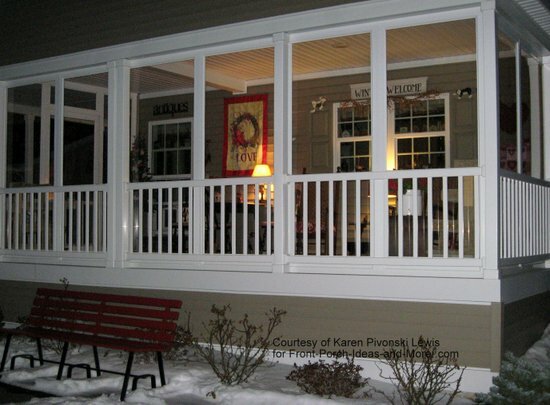 Our thanks to Karen L., of New Hampshire, for allowing us to show you her beautifully decorated Valentines enclosed front porch. See what a little love can do! 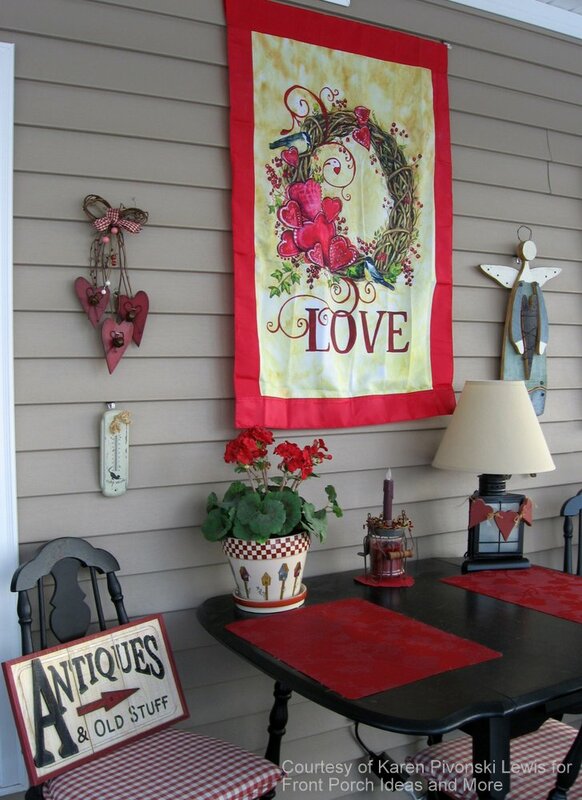 A really nice way to display Valentine quilts and other pretty decor. 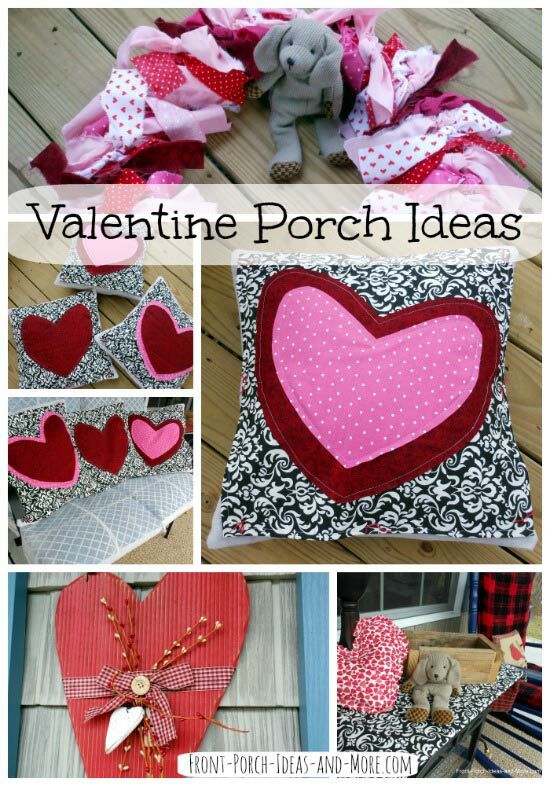 We hope you can use some of Karen's ideas for your own front porch Valentine's Day celebration. 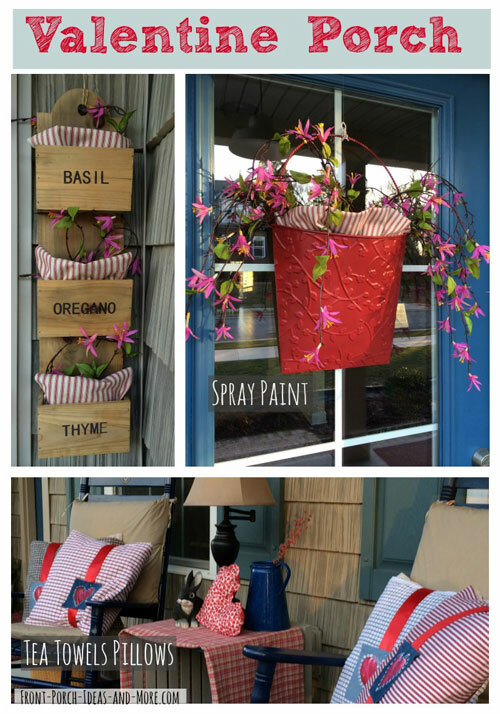 Come take a look at how we decorated our porch for Valentine month. 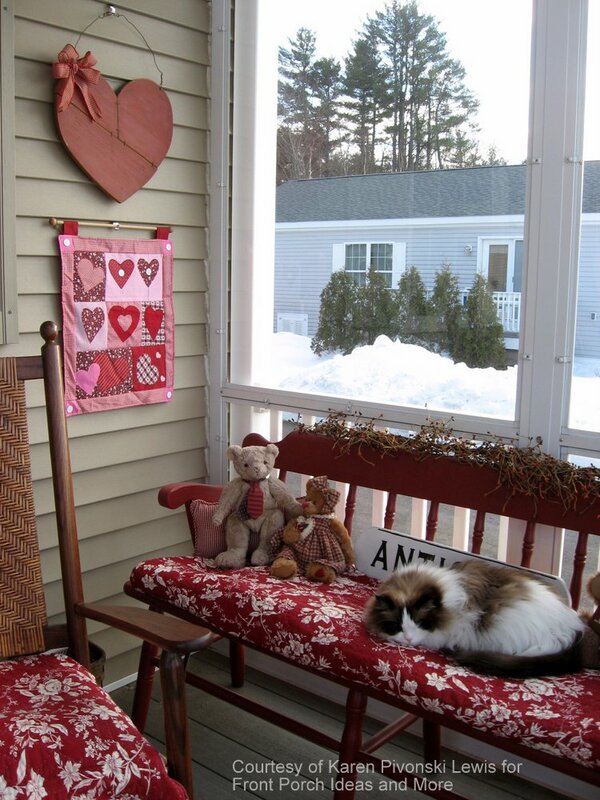 Our Valentine decorations are a bit unconventional, but kind of adorable nonetheless. 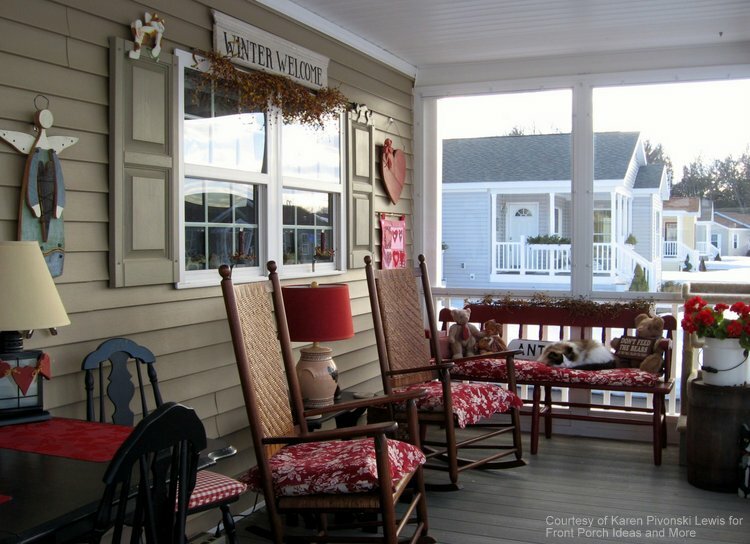 Shirl of Shirl's Rose Cottage shows us how to turn your porch into a romantic and beautiful space. 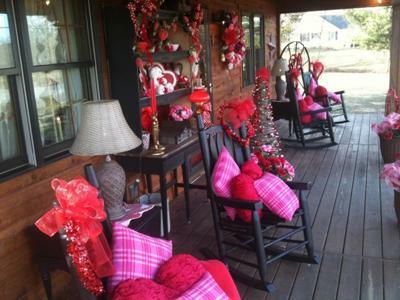 Shirl makes a wonderful transition from the Christmas holiday decorations to Valentine's Day. 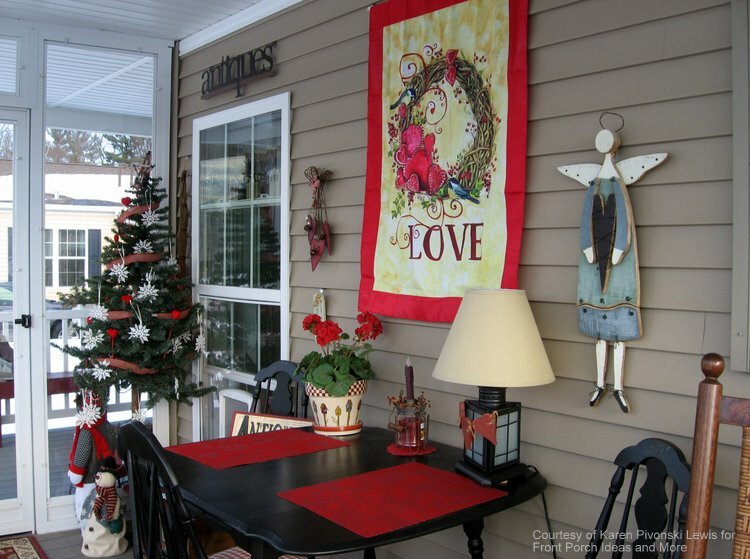 By keeping some of the same features, Shirl adds a bright red touch to the greenery and adds distinctive heart shapes to define the theme. 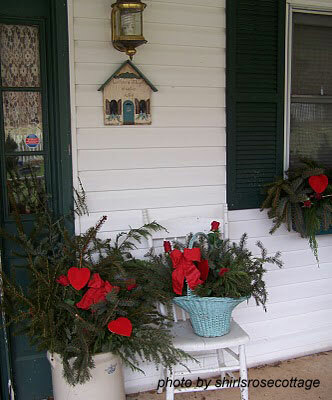 Shirl writes "I leave my blue spruce and roses in the window boxes that I put in at Christmas time and add some hearts and red bows for Valentine decorating". 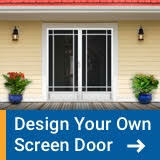 Start with your door. 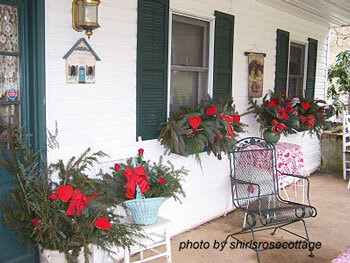 Shirl uses traditional red and white valentine colors on a round wreath. 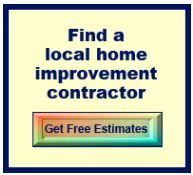 You could also find a heart-shaped wreath or make your own. 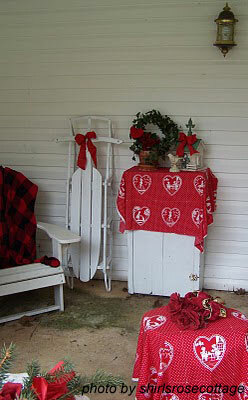 Themed valentine decorations like these table cloths drape the tables and the red plaid blanket draped over the chair adds warmth and texture. 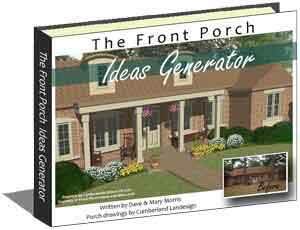 The sled works well for the entire winter season and can be placed on any porch in the winter no matter your location. 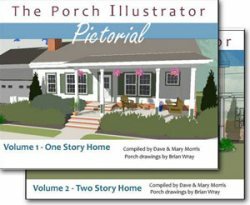 Our special thanks to Shirl of Shirl's Rose Cottage for sharing her Valentine porch pictures and the story behind her home. 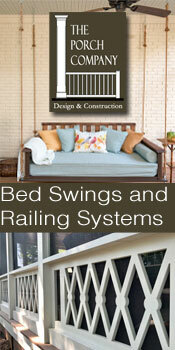 "My husband and I purchased this farm in 1988, we were the third family to own the property. When we purchased the farm in 1988 it was in very bad shape but we loved the ground and decided we would take on the challenge of the pre-civil war house. 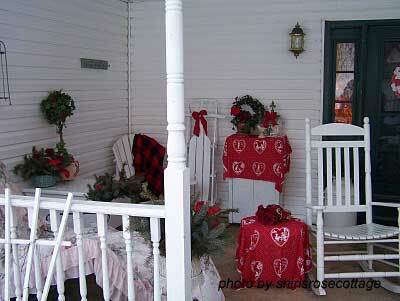 The out house was still in use when we purchased the property. 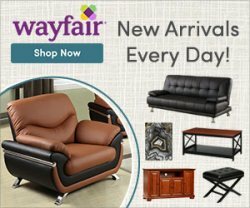 It was a two-seater, can you imagine? 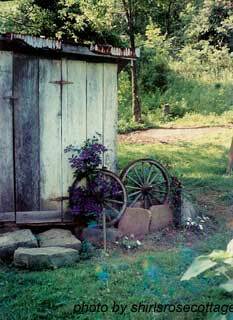 We moved it and now it is a garden shed. 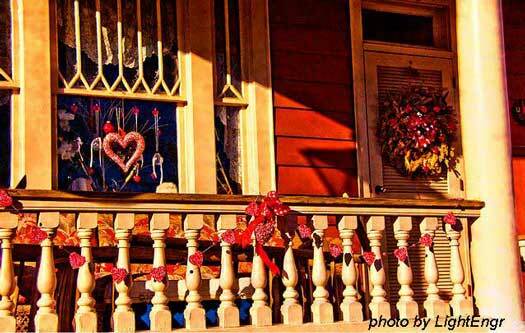 We hope you enjoyed these outdoor Valentine decorations. Shirl's son, Robert, and his unit, the 1092nd Maintenance Engineering Division, were deployed to Afghanistan in March 2010. 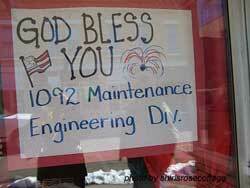 We extend our sincere appreciation to them and to all men and women serving their country at home and abroad. Looking for a Valentine Wreath Craft to Make?